Roaring engines. Sleek lines. The open road. Freedom, excitement, luxury and elegance. Not to mention that quintessential red. This is unquestionably the feeling of Ferrari. However, few get to sit behind a Ferrari wheel. So, My Italian Link got together with two of Scuderia South Africa’s ultimate fans to discuss what it really feels like to sell and own a Ferrari. Who better to explain the feeling of Ferrari than two Ferraristi (super fans)?! 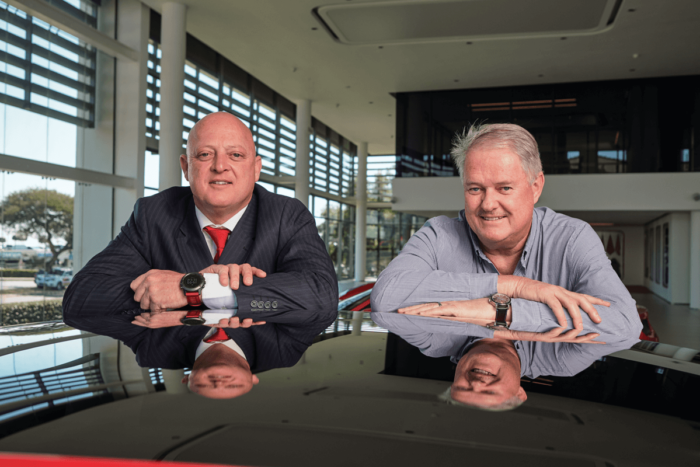 We sat down with Mike Tutt, who sells the Ferrari dream at Scuderia Johannesburg, and Zeus Venter, who is a long-standing customer. We discuss how these luxury cars become a real part of you, and what advice they offer to future buyers and members of the Ferrari community. What’s more, in conjunction with Scuderia South Africa, we ran a competition to find South Africa’s most talented young photographer, and invited the winner to conduct the photo shoot for this article. Details below! Mike Tutt (left) and Zeus Venter (right) leaning on the roof of a Ferrari. My Italian Link (MIL): Ferrari is perhaps the world’s most iconic luxury vehicle brand. What makes Ferrari cars so special? Zeus Venter (ZV): The starting years of Ferrari under Enzo have been controversial to say the least, but despite the many challenges faced, they always came out better, producing cars that were always way ahead of their competitors’ performance and technology. Mike Tutt (MT): Ferrari is the only thoroughbred car manufacturer left in the exotic luxury car market, with more than 70 years of expertise. The history of how Enzo Ferrari started, the racing history and the value retention the vehicles have are unsurpassed. MIL: If you had to describe the feeling of Ferrari cars in three words, which would you choose? MT: Performance, versatility & elegance. MIL: Speed, luxury, excellence, agility. Ferrari’s range offers it all. In your experience, what is a Ferrari’s best feature? “We don’t sell cars, we sell dreams.” – Former Ferrari President. MIL: Which model is special to you and why? ZV: The 246 Dino GTB. I had the privilege to acquire a 73 model as a project car about 6 years ago and walked the road with it throughout this process. I know all of its parts and what it took to get it all together again. MT: It is challenging to choose one favourite/special model. Each and every Ferrari is unique and fantastic in its own right. Each Ferrari model is equipped with supreme performance engines containing all the classic Ferrari power unit qualities, like the powerful and continuous acceleration at high speeds, the razor-sharp throttle responses and, of course, the exhilarating soundtracks. MIL: What’s it like to buy/sell a Ferrari? Could you describe the feeling? ZV: It starts with an image of a new model via media, then the features and characteristics. The model then grows on you to the point where you contact the dealer and get more information and pricing. Then the ordering and creating of your specific car begins…colour, wheels, interior, you touch and smell the leather, see the colour palettes – it becomes an emotional experience, combining all these things and seeing how it gels. A really exciting experience. MT: It is an amazing feeling sitting with a client and building their dream car in our Atelier on the Ferrari configurator. 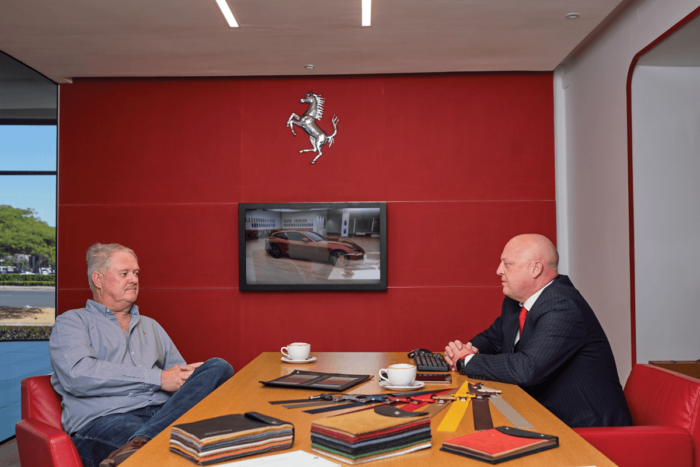 Ferrari offers exclusive personalisation programmes such as the ‘Tailor Made’ programme, designed specifically for clients wishing to create a truly bespoke car. Clients get to build their car exactly to their preference and taste, and get to decide on each and every single detail. Every purchase and sale is a unique and memorable experience. 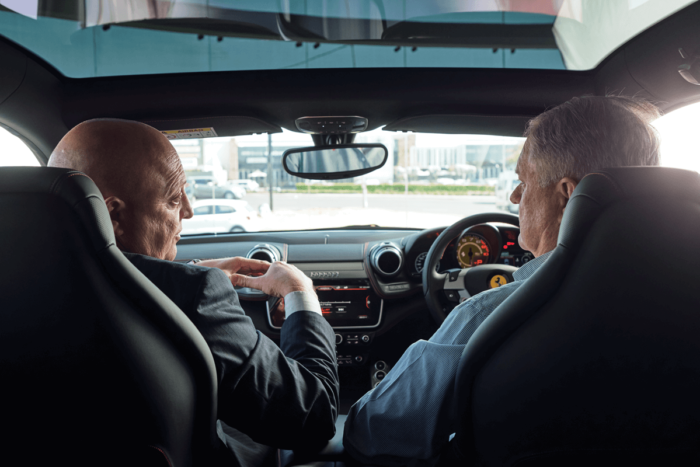 Mike and Zeus discuss the range of customisable Ferrari features. ZV: …dressing yourself in tailor-made clothing. Ready to be driven to a fancy event, but you get behind the wheel, and it’s a sensational transformation. MT: …being in a different world. Ferrari models offer blistering mechanical performance, complete comfort and driving pleasure – all at the same time. MIL: The Maranello factory is the iconic cradle of every Ferrari in the world. What does Maranello mean to you? 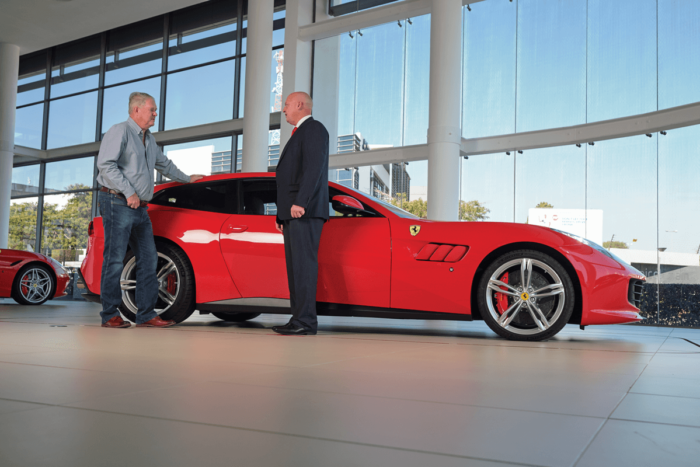 ZV: It’s the heart of Ferrari! Its surrounded by shops, museums, restaurants, the track and everything Ferrari. You have to go there to understand and experience it. It’s more than you can ever imagine. MT: Maranello is the heart of Ferrari. The people there eat, sleep, live and, of course, manufacture these iconic cars there. It is indeed a very special town. I have been fortunate enough to visit Maranello and Ferrari Factory several times. Witnessing the dynamic and precise way the factory operates on a day-to-day basis and viewing the stages of the production cycle was an experience like no other. Anyone looks good standing next to an elegant Ferrari! MIL: The Ferrari Empire encompasses more than just vehicles; there are the clubs, events, and client races, etc. Which extended Ferrari experiences do you enjoy most? ZV: F1, owners club events, and Mondiale track events for me. MT: I really enjoy the local Passione Ferrari Track events. Scuderia South Africa, the official Ferrari dealer, invites clients who have purchased cars from us to private track days. Clients thoroughly enjoy time around the track in their vehicles and we get to interact and connect with our valued clients regularly. MIL: People must have all kinds of reactions to the cars! What is the funniest question you have been asked about your/a Ferrari? ZV: Are all Ferraris red? Ready to hit the road and soak in the feeling of Ferrari. MIL: Is there anything people might not know about the cars that you’d want to share with them? ZV: Yes, once you have bought one, you want to buy more! MT: When purchasing a Ferrari, you get what I like to call the ‘Red Fever’. It sounds alarming, but it is in fact very good. For example, customers have brought me cars to sell for them and two days later they get in touch requesting their car back. They need to have a Ferrari in their garage. That is a sure case of Red Fever! Customers love being part of the Ferrari family. Want to know more about the feeling of Ferrari? Of course you do! Read our exclusive expose on Mampho Brescia’s GTC4Lusso test drive!